A Sartorial Look At The Hunger Games — Anna Akbari, Ph.D.
For many fans of The Hunger Games books series, Catching Fire is the favorite. It has a dynamic mix of Katniss and Peeta in District 12, in the Games and working to spark the revolution while trying to keep themselves and their families alive. With the movie approaching, we are taking a look back the the first Hunger Games film and what we know about the second, breaking down the wardrobe choices of different Districts and characters. District 12 is not unlike Depression Era America, without the need for women to wear dresses. The movie captured this reasonably well, yet with an overwhelming amount of gray worn by everyone in the district. (Director of Catching Fire, Francis Lawrence, noted in an interview that everything was a little too gray for him in the first film.) Linen, leather, and cotton are really the only fabric options shown for this district. The lifestyle is simple, with minimal technology and no money. District 12 locals all have very worn clothes that they likely wear every day, as the district is filled with poor coal miners. 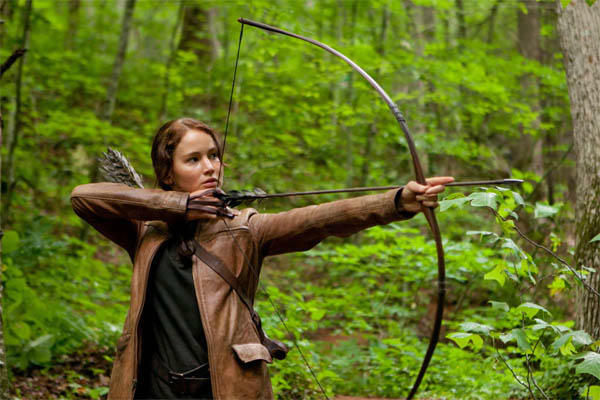 Katniss famously favors her side braid, her deceased father’s leather jacket, and flat boots. Katniss’s wardrobe is practical for hunting and running away from Peacekeepers, and is wearable for every day of the week. Interestingly, the filmmakers chose not to make Katniss’s oversized jacket oversized at all. The jacket was supposed to be a hand-me-down from her father, but this choice was likely made because oversized clothing doesn’t translate well to the screen. In the games and in training, the wardrobes are chosen by the capitol in modern weatherproof fabrics not available in district 12. Yet, for a good game, as the Capitol government sees the Hunger Games, clothes suited to the arena are key. In the case of Katniss’s first trip to the arena, they are in a forest setting that gets cold at night. They have light windbreaker jackets and simple pants and shoes to match, ideal for the conditions of the arena. The Capitol fashions for the tributes are much more elaborate and showy than anything they’ve seen or worn. The above picture shows Katniss’s elaborate hairdo and catwoman-like jumpsuit, which is about to be lit on fake fire for their grand entrance. Peeta wears essentially the same jumpsuit. Femininity in the male wardrobe is quite normal amongst the pampered capitol men and therefore the tributes when in capitol-given costumes. 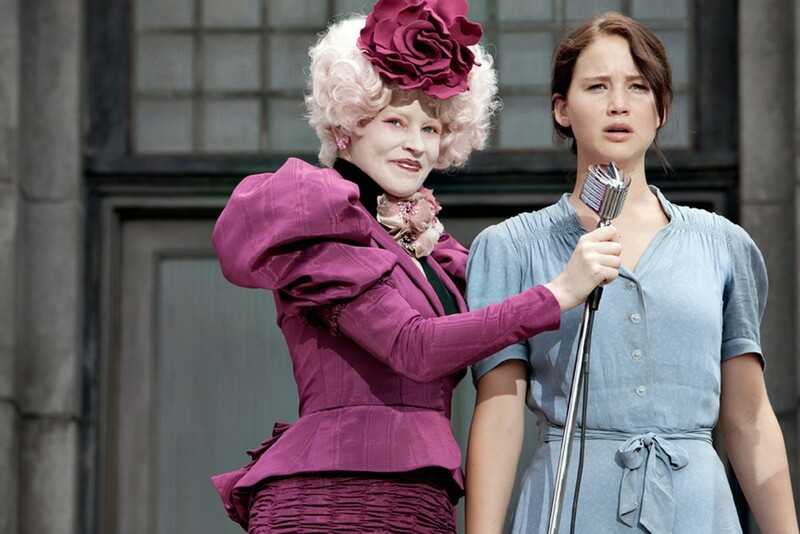 Effie Trinket is an essential character in the books and films to show the simple mindedness of Capitol locals. She is completely unaware that the tributes are more than a game she plays (for now). 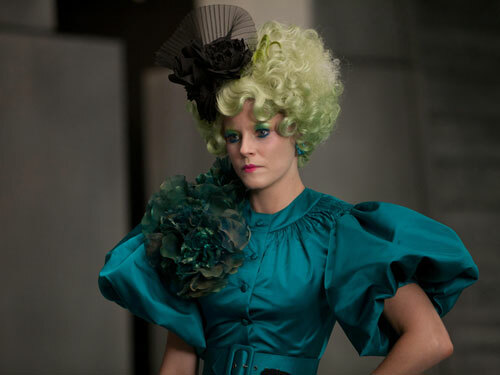 Effie’s style has a 21st century Marie Antoinette feel to it. It has almost no functionality with incredibly tight skirts, incredibly high heels, and tight corsets. But what would she need functionality for? Katniss’s wedding dress was of much speculation when the poster was revealed. An important part of the second book, and Katniss’s attempts to do what the Capitol wants, Cinna is supposed to design her dresses, chosen by Capitol voters. 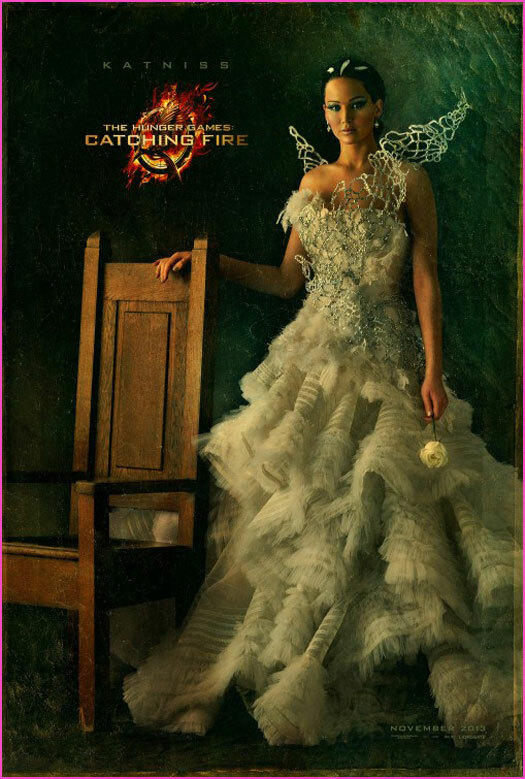 The dress needed to be fashion forward enough to fit into a Capitol environment, but realistic enough to wear it as recognizable as a wedding dress. 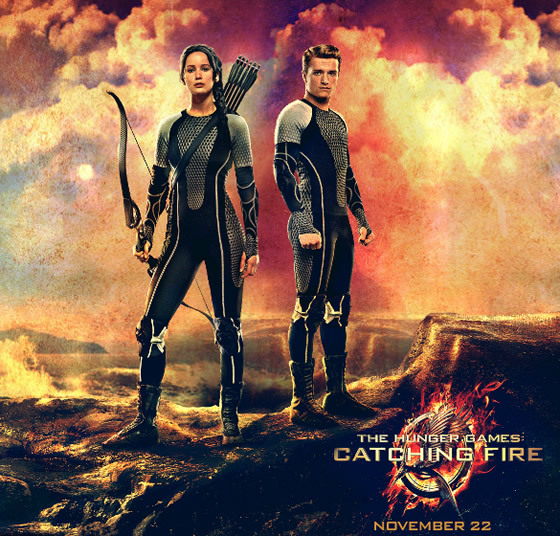 Even Peeta in the film posters is shown wearing what looks like what a Star Wars Storm Trooper would wear for an evening out. 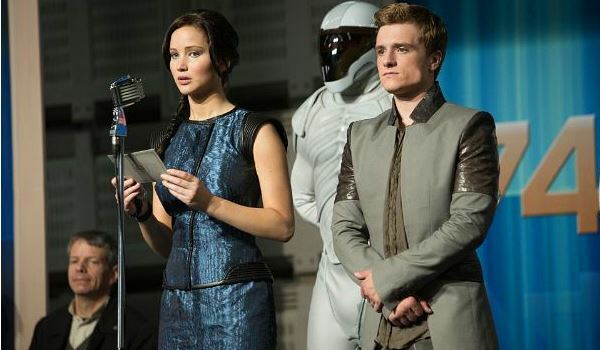 Even touring the districts, Katniss and Peeta are dressed to match, with leather details on both of their outfits. This is likely as the characters are given their clothes by Capitol stylists. Not to mention, Katniss, Peeta, and Haymitch are all trying to sell them as a believable couple. While we still have two months until the film’s release, there are plenty of trailers, interviews, and photos to keep all the fans buzzing with excitement. If you’re looking for a touch of Hunger Games for your Halloween or the premiere, check out Think Geek for some replicas from the first film.